For 2017, Rollerblade is introducing a new Metroblade, the 3WD, adding it to the existing standard and GM models. 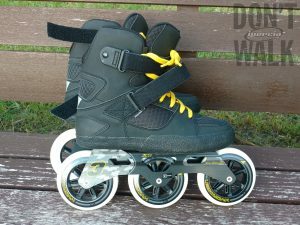 The 3WD is identical to the standard model, but with 3x110mm frames, 110mm Hydrogen wheels, ILQ9 bearings and… yellow laces! I was lucky enough to get an early production pair of the 3WD, and have been skating daily with them for the past couple of months. I love the Metroblade GM and I now love these just as much, as the boot is identical apart from the color and the shell being made from a cheaper material. The sizing is still way off, as I always wear 28.0, my GMs are size 27.5, and these had to be 27.0… and ended up being okay for me. This is something very important to know for anyone thinking of buying a pair! There isn’t anything new to say about the boot, as I’ve covered it in my Metroblade GM review. It’s pure awesomeness : Simple, homogeneous, stiff, incredibly well built and handling amazingly well. Definitely the best all-round skate boot currently on the market in my opinion. I’m personally not able to tell the difference between the 3WD’s composite shell and the high-end fiber one, as both are extremely light and stiff, so I would recommend going for the fiber pro model only if you can easily afford it or if you like the brown color more than the black (not my case!) or if you simply want to know that you have the best of the best on your feet. Now onto the “new” part : The 3 wheels. 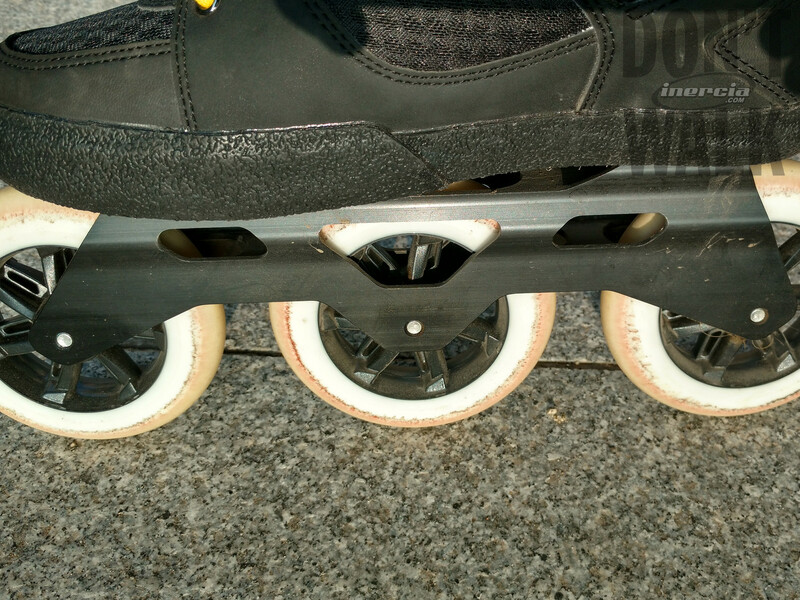 Rollerblade has definitely got it right with this skate, as the stiff base of the boot is perfect for high frames. I would definitely not recommend putting 110mm wheels on unmodified Twister boots, for instance, because they definitely need some reinforcement. But on the Metroblade, it’s absolutely fine. 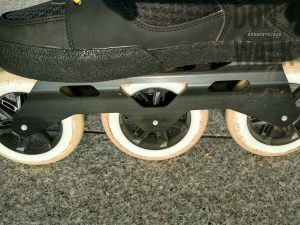 Also, unlike some other skates I have tried, the frames are perfectly vertical when standing still, which is ideal to avoid stressing your ankles. Honestly, I can’t find any flaws on these skates. I’m a huge fan of the laces and velcro straps : Those tighten perfectly and are super fast to close (I never actually tie the laces, I just pull them up and block them with the velcro straps, see pictures). Simply amazing skates. After two months of daily skating, the bearings are still perfectly silent, the hard 85A wheels are barely used (they’re actually hard to get sliding, they have a very strong grip!) and the boots are as good as new and comfortable as slippers. And the lack of a separate spoiler isn’t a problem, even with the extra height. Personally, I’m still not completely sold on 3x110mm wheels. It’s a great setup if you want to skate fast or far, but for short urban daily commutes, I still enjoy 4x84mm or 4x80mm more, as it makes the skates more agile and “fun” to skate. 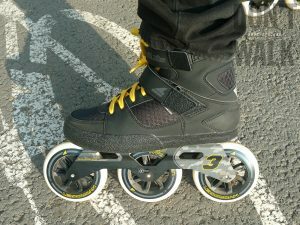 But if you’re thinking of trying 3x110mm, these are definitely ideal skates. If you later feel like going back to 4 smaller wheels, you can always mount your existing frames on them (Twister, Seba, etc.) and keep enjoying the great Metroblade boot! 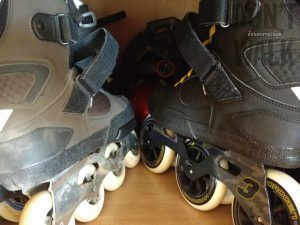 Rollerblade is also going to sell a kit which includes the frames, bearings, 110mm wheels and spacers, ready to swap onto your existing Metroblades (or other skates, just be careful that the front wheel doesn’t touch the tip of the boot). The 3WD skates come with optional sliders as well as black replacement laces in the box, in case you prefer the “full black” look and should be available starting December 2016. 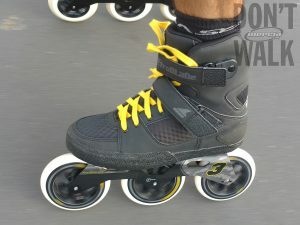 The skates will retail for 360€ and the kit for 200€. Would love to see 3×125 setup on that skates. This setup was the thing that put a stop to my bike trips, because my skates took back the streets and now I am the one with the world at my feet :) . 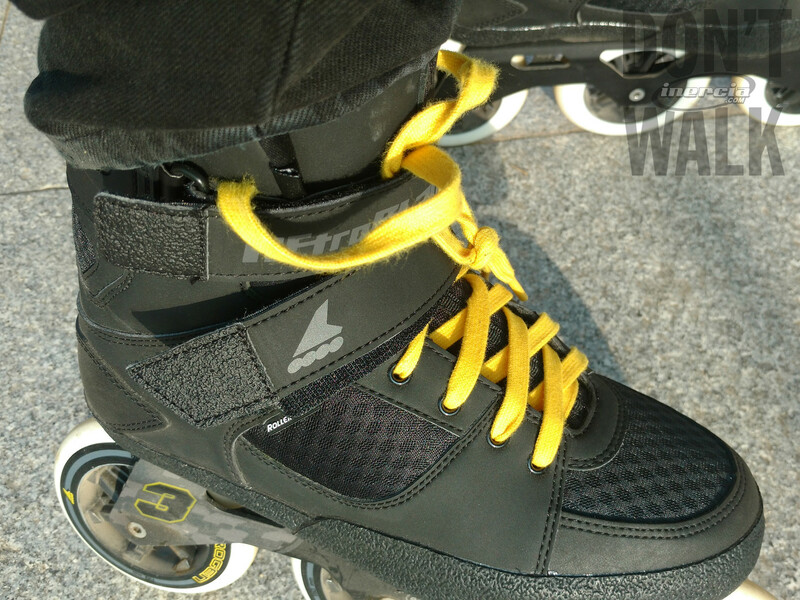 I want to test the Metroblade boot because I’m a huge fan of laces and velcro too. I hope to see those skates this spring in my country (Romania). I own a pair of Powerslide Megacruiser 3×125, they are awesome, but the boot is not so great. Both Seba FR1 and Powerslide Imperial boots hurts bad in the zone of lower fibula (maleola) and they need adjusting, i made some home-made shock absorbers from sport insoles (Decathlon sport insoles) and now they are ok, i raised my heels about 1,5 cm. The heat moulding helped too, so now i have a pair of “perfect skates” (in fact two pairs, mine and my girlfriend’s, who had the same problems with Imperials and Sebas too). Metroblades looks like something comfortable from the start and looking awesome, and i like the ideea of non-detachable liners, laces and velcros. I can’t wait to test them, and if they will fit perfectly i guess we will have another two pairs of skates in the house :) . Hello Thias. I would like to ask you about sizing. My feet is 25,5cm long. Not wide, jest normal. What size i should buy? 39 or 40? Thanks, Roman. P.S I like your YouTube channel. If your feet are 25.5cm, and you normally use size 40 EU for shoes and other skates, I would recommend you try size 39 EU (25.0cm) first for the Metroblade, especially since you mention that your feet aren’t wide. P.S. Not sure what YouTube channel you mean, as I don’t (think I) have one.